Usually I read anything new by Andy Andrews as soon as it comes out, but my work schedule has been brutal of late so I’m just now getting this new one. 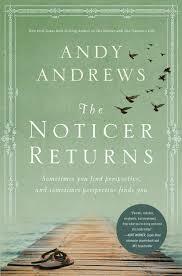 THE NOTICER RETURNS is a follow up of sorts to Andy’s extraordinary book, The Noticer where he first introduced the character known simply as Jones. Here Jones reappears into the lives of several south Alabama residents to help them find a different perspective. Where The Noticer was all about having a different perspective, The Noticer Returns is about perspective and a whole lot more. Here Andy delves into some sage wisdom on many other aspects of life, primarily parenting. I’ll come back to that in a moment. Not everything here however, has to do with parenting, but rather with life in general and working our way through the difficulties. As always with Andy’s work, the reader will come away with a handful of nuggets that will leave you thinking, “Why didn’t I think about that before?” For example, we’ve all heard the expression, “Don’t sweat the small stuff”, when in reality, it is the small stuff that really has major impact on our lives. Those tiny, seemingly inconsequential, decisions that have a huge impact over time. Life is filled with these “small stuff” decisions like choosing to eat a piece of pie instead of an apple. Maybe you choose to watch some mindless TV show rather than read a book that might hold valuable information for you, or perhaps our most critical “small stuff” decision, doing something other than studying the Bible. There’s one line in the book I simply have to mention and it goes like this: If you’re doing what everyone else is doing, you’re doing something wrong. Why? Because most people are not obtaining results that are considered extraordinary. How true is that! Think about that the next time you find yourself “doing what everyone else is doing”. Towards the end of the book Andy talks about how our reputation is determined by our thinking. It is excellent how Andy explains this; our reputation is determined by the kind of results we produce, our results are determined by the actions we take, our actions are determined by the decisions we make, our decisions are determined by what we think. The only thing I would add is that our thinking is determined by our vocabulary. We think in terms of words and if we have a limited vocabulary, we obviously have limited thinking, limited choices, limited actions, limited results and a limited reputation. If you want to change how you think, you need to expand your vocabulary. As I mentioned already, an underlying premise of the book is about how to be a better parent. I’m not going to go into the multitude of lessons contained on that subject. For that, you just need to read this wonderful new release by Andy Andrews. You can thank me later. 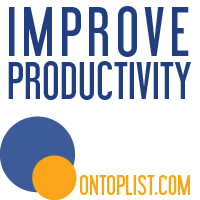 This entry was posted in Book Reviews, Choices, Growth, self improvement and tagged Andy Andrews, Book Reviews, Noticer Returns, The Noticer: Sometimes all a person needs is a little perspective., Vocabulary. Bookmark the permalink. Suzanne, I like what you said, “to be like Him we must think like Him”. That’s where we fall so short. He has given us His Word. The Bible is often called the mind of Christ and it is to be meticulously studied isogogically, categorically and exegetically, not just casually read every so often and hoping for the best. I look forward to 2014 and getting the opportunity to build on our relationships. Merry Christmas.